Yes, I rode this morning. Why wouldn’t I? Skyline needed to be cleaned up. Who else is going to do it? How many cars just drove on past without doing anything about this? 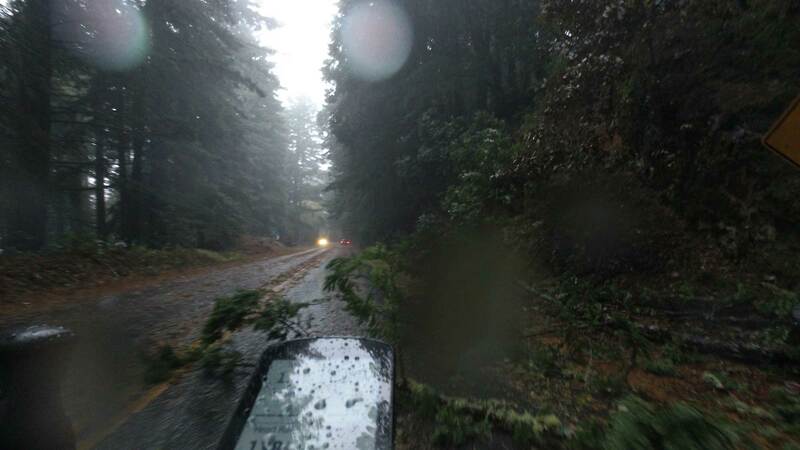 The “after” photo, with the tree removed from the roadway. This morning began pretty strongly; lots of wind, lots of rain, and even some thunder tossed in for effect. In fact, a big one hit just as I was rolling out. Just… me… today. Well, guess I should count the one other person I saw out there, a woman jogging, who titled her run “All the adversity” on strava. Younger Kevin wasn’t feeling well (seems like he’s getting over something) and I later got a text from the other (pilot) Kevin asking if I rode today. As if? Was he hoping I’d say no, so he’d feel better about staying in? I took it pretty easy, just enjoying nature’s show on the way up. Pretty noisy from all the wind, sometimes making it sound like there was a car nearby. I looked for tire marks on the wet pavement, thinking maybe, possibly, someone else was out there this morning, but no sign of anyone else. 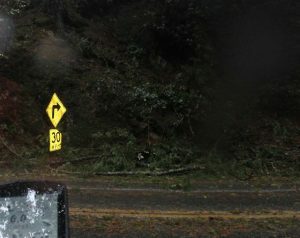 There was a fair amount of debris on the road, as can be expected when it’s windy, but it was only the one place on Skyline where part of a tree actually fell into the road, waiting for me to come by and clean things up. Think about how many cars drove past without stopping to do something about it. Quite literally an accident waiting to happen. It was a bit heavy but not impossible to move; more difficult was a very large branch that I had to break off to get out of the way. Whatever, you do what you have to do to make the world a little bit better place, one fallen tree limb at a time, right? Somebody did likely call in the downed tree though, as I passed a Sheriff and County debris-clearing vehicles heading in the opposite direction after I got going. They’re just not quick enough for the cyclists! Temps weren’t too bad; I was a bit overdressed for the main climb but fine up on top and descending. Because I was taking it pretty easy, there was no way to do the West Old LaHonda loop. Surprisingly, the roads felt pretty grippy, so much so that, despite the rain, I wa sable to keep up with the cars descending 84. Keep in mind this was on my rain bike, a Trek Boone ‘Cross bike with wider tires (Bontrager AW3 700x28c) and disc brakes, both of which make a big difference in the wet.